This interview took place on: 1/14/10. 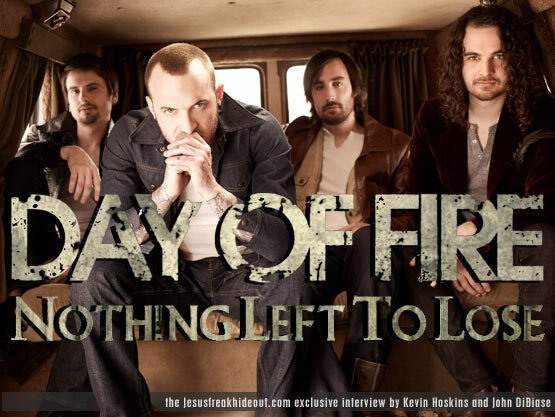 Jesus freak Hideout (Kevin Hoskins): We haven’t heard much from Day Of Fire for a few years – What has the band been up to (since the release of Cut & Move up until recording Losing All)? JFH (Kevin): Can you tell us about the new record label? How did you come to team up with Razor & Tie? JFH (John DiBiase): Tell us about your new album Losing All. It seems to deal a lot with broken relationships and loss. Was this an intended theme going into the writing process? Can you talk about it? JFH (Kevin): Were there any changes in the way/how you wrote this album from the previous albums? JFH (John): Can you tell us about the album cover art? JFH (John): What's the story behind the song "Airplane?" JFH (John): Can you tell us about the song "Hello Heartache?" Josh: In that song, Heartache is the character in a story... I am singing to that character. JFH (Kevin): Can you talk about the thought behind the song "The Dark Hills?" JFH (John): Chris said in a video blog that around 20 songs were actually recorded for the record before it was narrowed down to 13 tracks on Losing All. Do you have any plans to release those extra finished tracks? JFH (Kevin): Who are some of your musical inspirations - especially for the new album? Josh: My musical inspirations are always the same: STP, Soundgarden, Alice in Chains, Pink Floyd, Cash, Nirvana. JFH (Kevin): Josh, do you ever meet people who recognize you from your "Full Devil Jacket" days? How do you handle/deal with it? JFH (Kevin): Do you have any tour dates set for the release of the new album? If so, who else will be touring with you and do you know where some of the cities that you'll be visiting?